Baptism is the gateway to all the other Sacraments and, indeed, the life of grace in the Church. 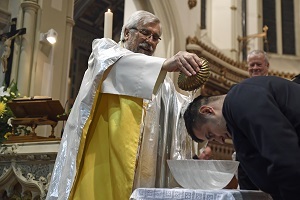 Through the pouring or immersion in water in the name of the Father, Son and Holy Spirit the infant or adult becomes part of the Church. In this Sacrament we die with Christ that we might share in his resurrection (Romans 6). Baptism is the sacrament of salvation that opens for us the way to eternal life. Baptism of adults typically involves at least a year of enquiry and instruction in the Faith of the Church. This is covered in the RCIA Programme. The sacrament of infant Baptism is celebrated once a month in a communal celebration on Sunday at 1pm. In order for a child to be baptised the parents must attend a preparation session. These preparation classes take place monthly on Tuesdays at 7pm in the parish room and are led by Fr Colin with our Catechists, Harry and Goretti Robertson. Please complete the Baptism Preparation Application Form and return to the Parish Office. These forms can also be found in the wall rack in the porch. The family of the child should reside in Sacred Heart Parish boundaries. 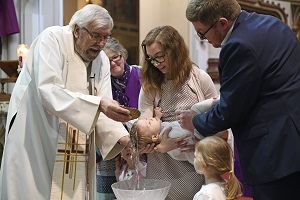 If a family lives outside the boundaries they may register as parishioners or request and present a permission letter for baptism from their parish of residence. Families who are registered at another parish may still have their child baptised at Sacred Heart if scheduling is available. A letter of permission to baptise from their pastor will be required. Parents are required to attend a baptismal preparation class at Sacred Heart. Please complete the Baptism Preparation Application Form. The church requires a minimum of one confirmed adult Catholic godparent who should be practising in the faith and be available to support the family in the Christian life. Baptised Christians of other denominations can also be ‘Christian witnesses’ in a similar role to the Godparents.